This collection of Happy Tree Party Supplies helps you create a wonderful baby shower party – or anything else! This selection includes lots of pretty pink and blue designs, including balloons, personalized invitations, tableware items for a wonderful meal, wonderful decorations, cake supplies, and much more, great for a wonderful event! There’s something oh-so whimsical about owls, it’s no wonder they are a favorite animal among children. For little girls who want a unique party theme that goes beyond princesses and ponies, Owl Blossom is the perfect choice. A plethora of pinks, purples and blues combine to create incredible designs that are sure to make the party undeniably stylish yet playfully fun. All the guests will have a hoot when you plan festive games and serve tasty treats. Your daughter will have so much fun, she’s sure to say “Owl love you forever” after a day of celebration! There’s no need to wait until the day of the party to decorate. Get the birthday girl involved and decorate the day before! It’s a fun way to bond and boost excitement for the big event, plus she’ll love giving input on where to place balloons, streamers and more. Want to find a unique birthday-party activity that will leave them hooting for more? Owl-themed crafts are sure to please. For example, collect pine cones and then cut out shapes from various colors of felt for eyes, wings and beaks. Then let kids glue the felt pieces on the pine cone to create a little owl friend they can take home with them! Hoo hoo hoo wants to come to your little girl’s special party? Everyone! To set the mood for a fun day or night, you must have the right decorations. Colorful decorations brighten any event space, whether you’re hosting the party at home, outside or at another location. Start with a big banner that announces the celebration and features the birthday girl’s picture. 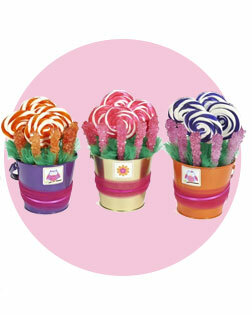 She’s sure to squeal with delight when she sees balloon bouquets in a variety of vivid colors. Don’t forget the serving ware, too – plates and cups that feature our too-cute owl and beautiful blooms make the perfect place settings. 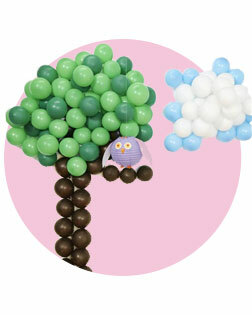 Transform your event space into a wooded wonderland by making this DIY Owl Blossom Balloon design. Sure to be a beautiful focal point of the party, it’s surprisingly simple to create. Simply order the supply kit, follow a basic steps and – voila! – it’ll look like you hired a professional event designer. The birthday girl will hoot “hip hip hooray!” when she sees her very own picture featured in our festive Owl Blossom Personalized Photo Banner. Available in a variety of sizes, you can customize this high-quality banner with the photo of your choice as well as personalized text. All the little owlets at the party will have grumbly tummies after all the party fun they’ll be having, so be sure to get ready with some sweet and savory treats. Cupcakes or cake, full meal versus snacks – choose what works best for you and your crew. Of course, any food you serve will become a fun part of the party theme when you get Owl Blossom tableware. Cups, napkins, plates and more are available, all featuring Miss Owl in vivid colors. Finish with plasticware and a disposable tablecloth to make cleanup a breeze! No party is complete without a few fun activities for the party guests. What a hoot it will be if you plan a dance party where everyone gets to show off their best moves. Another bright idea is to gather the kids for an owl-themed scavenger hunt for things like feathers, flowers and colorful rocks. A classic party piñata is sure to inspire laughs as each child twirls and whirls while trying to release the treats within. No matter what you plan, remember to snap a few pics so you can remember events with the birthday girl long after the party is complete. Owls may be known for their incredible eyesight, but when you put that blindfold on each child and watch them try to break open the piñata, you’ll likely see a variety of comical swings! That’s half the fun, after all, and once the lucky child breaks open the piñata, everyone wins when they scramble to get the candy and treats inside. Whimsical wall decals transform any boring wall into a beautiful owl focal point. Place the decals in the party room on the big day and take turns taking pictures of all the kids by the colorful oversized owl and flowers. Best yet, these decals are reusable, so after the party is complete you can move them into your little lady’s room for a stylish reminder of her big day. Hoo’s going to be happy at the end of the party when you hand out the best party favors around? All the little owls, that’s HOO! You and your child can show how much you appreciate her friends by gifting a small present. This token of appreciation teaches gratitude to your daughter while giving all the kids something special to take home. Candy, clay, jewelry and bubbles are just a few fun ideas for favors. Select one item or add multiple items to a gift bag and write each child’s name on it. They’re sure to hoot as they discover what’s inside! Feeling crafty? These DIY Owl Blossom Favor Buckets are as pretty as the contents are delicious! Our five-step tutorial makes the process simple with a result so sweet, kids may not want to wait until the end of the party to dig in. Want an adorable all-in-one party favor option that saves you time? Our Owl Blossom Filled Party Favor Box has everything to make party guests smile from ear to ear. They’ll love opening the charming owl box to discover goodies like nail polish, stickers, crayons and more!